Also known as Vasant Navratri, its first day begins with the Hindu New Year. Shardiya Navratri is celebrated pan India and known as Durga Puja in Bengal. Dedicated to the Goddess Shakambhari, it is celebrated by some people in Paush month. Goddess Shakti is worshipped during this Gupt Navratri, which comes during the month of Ashadha. Also known as Shishir Navratri, it is celebrated in the month of Magh. 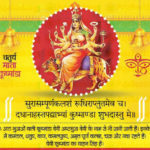 Among 5 Navratris, one is Sharad Navratri, which is celebrated with great pomp and show by all Hindus. However, rest 4 has regional relevance. After Sharad Navratri, Chaitra Navratri is celebrated quite significantly in some areas. Religious events are conducted to mark the occasion and celebrate the festivity. On the other hand, social gatherings and fairs are conducted around Shakti Peethas and sacred buildings during Chaitra Navratri. Rest three are Navratris are called Gupt Navratri (Magh Gupt Navratri, Ashadha Gupt Navratri & Paush Gupt Navratri). These are celebrated by very few people and are known for different occult practices. 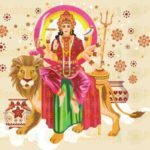 Among these Gupt Navratri, very few people are familiar with Paush Navaratri. Navratri is an amalgamation of two words: “Nav” + “Ratri”, which basically means nine nights in english. This festival is celebrated throughout India with lots of excitement and joy. It is a prevalent festival observed on major parts of Gujarat, West Bengal and Delhi. Devotees express their gratitude towards Maa Durga, carry out Durga puja and pray for good health, life and mind. After ninth day, tenth day is celebrated as Dussehra, also known as Vijayadashmi, which marks the victory of Lord Ram over King Ravana. The festival of Navratri holds a great significance in Hinduism as it marks the triumph of good over evil. These nine days are considered sacred and pious, and consumption of alcohol, meat, onion and garlic is strictly prohibited. People avoid carrying out any unlawful activity and perform ceremonies, rituals, yagnas and much more. ● Day 1: Shailputri: Goddess Shailputri, an incarnation of Maa Parvati, is worshipped on this day. In this form, she can be seen sitting on Nandi the bull with a Trishul in her right hand and Lotus flower in her left one. Color of the day remains Red, which represents courage, vigor and action. ● Day 2: Brahmacharini: On second day of Navratri, Goddess Brahmacharini is worshipped. She is said to be one of the many incarnations of Maa Parvati who became Sati, the pure one. One worships the Goddess to attain moksha or salvation and peace. Color of the day remains Blue, which depicts calmness and positive energy. In this form, she can be seen holding a kamandalu and japmala in her hands while walking bare-feet. ● Day 3: Chandraghanta: Goddess Chandraghanta is worshipped on the third day of Navratri. The name was derived after Maa Parvati got married to Lord Shiva and adorned a half-moon on her forehead. Yellow, the color of the day, depicts bravery. ● Day 4: Kushmanda: Goddess Kushmanda is worshipped on the fourth day of Navratri. She can be seen sitting on a Lion with eight hands. She is said to be the one endowing vegetation and greenery on Earth, which is why color of the day remains Green. ● Day 5: Skandmata: The mother of Lord Kartikeya or Skanda, Goddess Skandamata, is revered on the fifth day. She can be seen having four arms, holding her small baby and riding a fierce lion. She depicts the mutating power of a mother when she realizes her child is in danger. Color of the day remains Grey. ● Day 6: Katyayani: A violent incarnation of Goddess Durga and daughter to Sage Katya, Goddess Katyayani is worshipped on the sixth day. She represents courage and is seen having four hands and riding a lion. Color of the day remains Orange. ● Day 7: Kalratri: Maa Kalratri is known to be the ferocious form of Goddess Durga and worshipped on Saptami. Color of the day remains White. It is believed that Maa Parvati’s fair skin got transformed into black in order to kill Sumbha and Nisumbha, two demons. 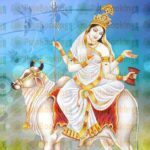 ● Day 8: Mahagauri: Maa Mahagauri is worshipped on the eighth day of Navratri, and symbolizes peace and intellect. Color of the day remains Pink, which represents positivity. ● Day 9: Siddhidatri: The ninth day is known to be Navami, and Maa Siddhidatri, also called as Ardhanareeswara, is worshipped. She is said to possess all kinds of Siddhis. She can be seen sitting on a Lotus and has four hands. A demon named Mahishasura was a big worshipper of Lord Shiva. Impressed with the demon’s devotion, Lord Shiva became happy and blessed him with a boon of not getting killed by any man or god. This blessing got on Mahishasura’s head, making him arrogant and proud. He started terrorizing the natives, attacked their homes and created problems for everyone. After destroying Earth, he targeted Heaven and scared the gods too. The Devtas went to the Tridev; Brahma, Vishnu and Shiva; to attain a solution, who created Maa Durga. After a vigorous game of hide-and-seek, Maa Durga finally found the demon and killed her. This remarked the victory of good over evil. Lord Rama was a huge worshipper of Devi Bhagwati, the ultimate superpower. He devoted himself into her worship for nine days straight so as to gain victory against Ravana. On the ninth day, Devi Bhagwati appeared in front of him and granted her blessings, and on the tenth day, Lord Rama killed Dashanana. 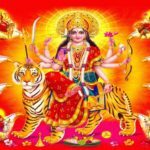 Since then, different forms of Devi Bhagwati are venerated for nine days straight and Vijaya Dashami is then observed on the tenth day. The festival of Navratri is widely celebrated in Eastern India and West Bengal. Pandals are made and streets are decorated. Different forms of Goddess Durga are installed in pandals and worshipped by thousands of devotees. On the tenth day, her statue is carried with a great procession and immersed. Sindoor Khela or playing with Vermillion is a famous ritual people follow during Durga puja, where married women apply sindoor on the feet and forehead of the goddess and then on each other’s faces. In the state of Gujarat, devotees fast for nine days, worship different incarnations of Goddess Durga and perform Garba. This is a very famous dance form played with sticks between two people. Both men and women wear colorful clothes and play Dandiya. In UP and Delhi, Ramlila marks the beginning of Navratri. Big stages are set up for the show, which are known to be grand and spectacular. For nine days, Ramlila concludes all aspects of Ramayana and on the tenth day or Dashami, effigies of Ravana are burnt all around the city and country. In Bihar, local temples hold celebrations and pujas, and a local fair in Sitamarhi is arranged. Pottery, handicrafts, kitchenware and houseware are displayed on a large scale. ● Wake up early in the morning, take a bath and wear clean clothes. ● Get all the ingredients mentioned above. ● Arrange a thali for puja with all ingredients in it. ● Place the idol or picture of Goddess Durga on a red-colored cloth. ● Place the claypot, sow the barley seeds and sprinkle some water everyday till Navami. ● In an auspicious muhurat, carry out the process of urn installation or Ghatasthapana. Fill the urn with Gangajal, and place mango leaves on the top of its mouth. Wrap the neck of the urn with sacred red thread or Moli, and coconut with red chunri. Place the coconut on the top of mango leaves. Place the urn near or on the claypot. ● Carry out panchopchar puja of the deities, which includes worshipping with flowers, camphor, incense sticks, scent and cooked dishes. ● Chant Maa Durga Mantras throughout these nine days and ask for prosperity. Invite her into your house and ask her to grace your house with her presence. ● On the eighth and ninth day, carry out the same puja and invite nine girls at your house. These nine girls represents nine forms of Goddess Durga. Hence, wash their feet, offer them a clean and comfortable seat. Worship them, apply tilak on their forehead and serve them delicious food. ● On the last day after Durga puja, carry out Ghat Visarjan. Say your prayers, offer flowers and rice to the deities and remove the Ghata from the altar. Hope you like this article and gain major insight about the festival of Navratri. AstroSage wishes you a prosperous Navratri and Vijayadashami.